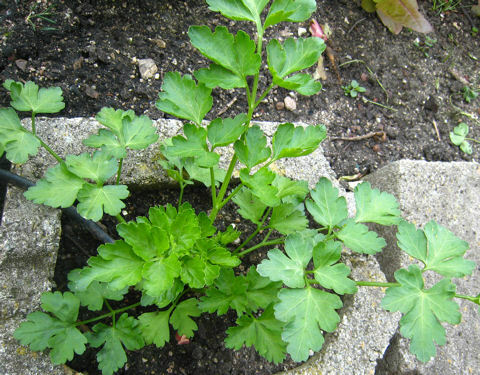 Parsley seeds can be tough to germinate. Certain seeds with a hard seed coat take a bit more patience and work to grow successfully. Here we hope to give you a few pointers that can help you get some of those challenging seeds to sprout. Here is a partial list. The first five belong to the Parsley family (Apiaceae). I am sure others will suggest more and we will keep this list updated. Start by soaking seeds in warm water (90-100F or 32-38C). I like to start with a small cup and fill it halfway up. 2-3 hrs. later, add some more warm water. Soak overnight. Some people put seeds on wet paper towels and wait until visible signs of sprouting and then plant the paper towel with the seed in the soil. If you wish, you can cut the paper towel into strips and line it with seeds. Keep the paper towel water wet. For both approaches, use warm water when you plant the seeds. You can use water from a garden hose that has been out in the sun. Always put your hand in front of the stream and test before watering. If it is really hot and sunny this may be too hot, so use caution and common sense. There are other methods like “mechanical scarification” — nicking, sanding, and filing the seed coat, but I’ve had success with the warm water approach. We’d love to hear which hard seeds you’ve started and your technique to get them to sprout! It’s nice to meet you! Thanks for following on Twitter! I just started my vegetable garden today and am so excited to be diggin’ in to the dirt. From the looks of the list, I don’t think I have any hard seeds. I do have peas, but I don’t remember them being hard per se. The beans seemed hard, and so did the pumpkin seeds … but other than that, most of the little guys were teeny-tiny and packed full of promise! Vyzion, hi & thanks stopping in and best wishes for a successful and bountiful garden this year! My wife plants sweet peas for flowers and I plant snow peas for the table 🙂 Both of us have discovered that it does take a while for the peas to sprout so if you have plenty of seed, you might want to experiment with a few pre-soaked peas in 75F water (no warmer or it may actually deter germination!) and compare the germination rate with the non-soaked peas. Please report back on Twitter or this page! hey, I added you on twitter and thought i’d read this blog too. I’ve a postage stamp size balcony in the middle of London but am planning it to be groaning under the weight of veggies, have started off various seeds. I’d just add, that I’ve never had to soak seeds before germination, but am intrigued as to the benefit a pre-soak does. does it speed up the germination? won’t they get soaked when they are in the soil and watered? Hope we get a picture of that veggie balcony, Tom! Good Q. Germination depends on temperature and water content, among other variables (light, even minor nicking of seed coat, etc.). As long as your seeds are not sitting in water-logged, soil, they’ll be fine. The warm water pre-soak is believed to work like an “alarm clock” to tell the seed it’s time to sprout. And again, we do this only for parsley, celery and other hard seeds. We planted non-pre-soaked parsnip seeds directly in the soil and had a great harvest that year but it did take ~4 weeks to see “evidence” it was growing. Compare that to beans – which take 4-7 days! Great tips. We have had success starting our peas and carrots without soaking… Believe it or not, it’s our pepper plants that we just can’t jumpstart. Do you have any tips for bell peppers? Pepper plants really like warmth and we’ve had success starting them indoors. We’ve never presoaked them, but have kept them warm indoors at 70F and higher. If they’re in the ground at 50-60F, you’re not likely to see much action. Do you plant them directly outdoors and when? I’ll second what Plangarden says about peppers needing warmth. I tried starting tomatoes and peppers in my cellar seed starting area – just shop lights over shelves with a very under-powered baseboard heater. It’s only about 60F down there. The tomatoes took a while, but they germinated and are doing well. The peppers, however, rotted before they could germinate. I tried starting a second batch, and this time I put the seed pots on a windowsill in the corner next to our woodstove. It is over 80F there. The peppers seemed to sprout in almost no time at all, once they got the heat they wanted. Thanks Janis, that’s a really good anecdote. We’ve also had similar experience putting out zucchini way too early. We sometimes use this seed mat bought at Amazon, but you can also make your own grow box which is a less costly alternative. But a sunny window is really the cheapest method! Good luck! Hi LA Girl – Chard’s really easy to start from seed; the soaking just helps get it started. Give it a couple of weeks to start coming out of the soil. Once it’s up, there’s no stopping it. Enjoy it sauteed in olive oil, garlic & pine nuts! as requested, here’s a link to some photo’s of my balcony veggie plot. it’s coming on well and I’m getting great pleasure growing my own in the heart of the urban jungle. Tom, thanks for that link. Hey, it looks like there’s plenty enough space to grow what you want. Great idea to add the flowers to attract friendlies (we love seeing ladybugs, too!) and deter nasties 🙂 When did you plant your garlic? One generally plants them in the autumn to harvest the following summer. They also need quite a bit of depth – 14 in. min. – so make sure your pot is nice and deep. So … thought I would try to put the lettuce out this week … no such luck … my two week old little seedlings couldn’t withstand the out and out attack coordinated by our neighborhood squirrels. Lettuce is one of the easiest veggies to germinate from seed so it’s never too late to start over again. We created this video to show people how to make their own growbox – you can do the same without adding the flashlights and just put it out in the sun, perhaps securing the top to the bottom with long, thick rubber bands or string. Let us know how it works out for you. hey thanks for the advice about garlic. it was more of an experiment thank actually growing to eat, but will look in to potting it on. I planted it recently as it was sprouting in the fridge, so it may come to nothing more than a nice bloom. Tom, if you haven’t read it yet, we highly recommend “The Great Garlic Book” by Chester Aaron for the stories/trivia, jaw-dropping photos, recipes, and amazing introduction to the varieties. Thanks for your response to my question about peppers. We planted them in our seedling trays and placed them under grow-lights alongside other vegetables. But it wasn’t until I placed the trays outside and the daytime temps warmed to above 70 degrees that we saw any germination. Now, all have germinated and are growing well. Our peas and carrots were planted outdoors. The peas are about 6 inches tall and the carrots are just getting their secondary leaves. Thanks so much for the tips! They are appreciated! Does anyone have any experience with germinating Stevia? This has been the only seed I’ve had trouble germinating so far and there there seems to be very little info about it out there. We haven’t had any personal experience growing Stevia from seed, esp. since it typically grows in tropical climates (we live along the cool, N. California coast). However, people have had success growing it from seed. Here are some references. Let us know how it goes. Good luck!